Tinted ZincO offers broad-spectrum protection from both UVA and UVB rays. It is an excellent barrier cream that protects the ultra-sensitive epidermis from the elements. Especially helpful for those prone to flushing episodes. ZincO soothes the skin and helps reduce visible flushing. 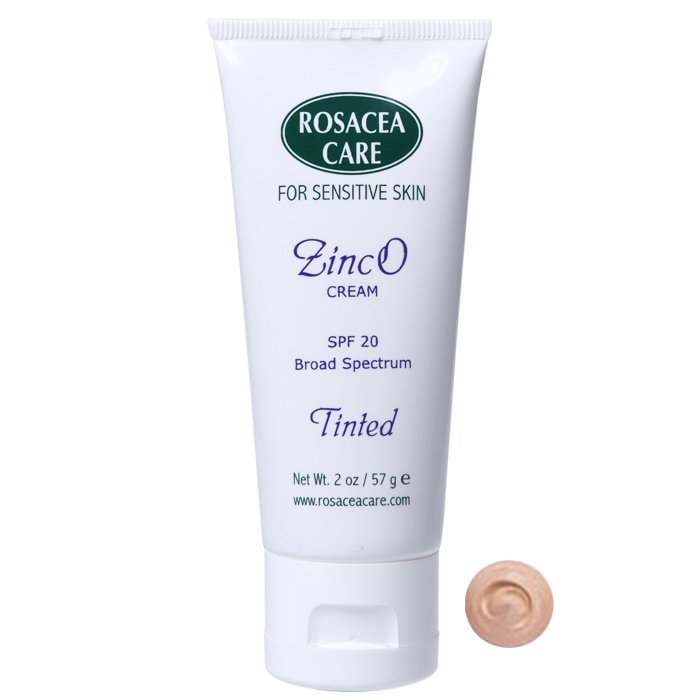 Tinted ZincO is flesh-colored, attractive and subtle it works for women and men. Especially effective in concealing facial redness and blemishes. This product was developed a professional dermatologist. It is highly recommended for anyone who wishes to use a fine physical sunblock. Tinted ZincO SPF 20 contains 14.5% zinc oxide as the active ingredient. This percentage of zinc oxide is one of the highest on the market. ZincO offers broad-spectrum protection from both UVA and UVB rays. Inactive ingredients: Water, C12-15 alkyl benzoate, glyceryl stearate, PEG-100 stearate, steareth-21, C13-14 isoparaffin, cyclomethicone, glycerin, laureth-7, phenoxyethanol, polyacrylamide, synthetic beeswax, dimethicone, iron oxides, olea europaea (olive) fruit oil, talc, castor oil phosphate, methylparaben, DEA-oleth-3 phosphate, propylparaben, chromium oxide greens, disodium EDTA, ultramarines. Apply a liberal amount to face and neck as often as necessary each day or before sun exposure. Reapply as needed. Store in a cool place.